Dr. R.C. Wallace "Wallace of Queen's"
A man doesn’t plant a tree for himself. In many ways, Blake's Ardfree in Northumberland County (next to Ganaraska Forest) was like Thoreau's Walden Woods in New England (Mass.) - of two great thinkers and symbolic places in the conservation movement - each with a scenic pond surrounded by woods (pine and oak trees) where the calls of the Whip-poor-wills are still heard. When V.B. Blake first came to the country farm in 1926 on the 9th Concession north of Port Hope, it was poor barren land having been almost clear-cut in the previous century. He named it Ardfree and until 2002, it was owned by members of the Blake family. The origin of the Ardfree name Blake chose for the farm in the Ganaraska region was a slight variation of the place named "Ardfry". In the homeland of Blake's ancestors, Ardfry was one of the famous historic landmarks of west Ireland (meaning: “The Height of the Heather”). Historical records show the Blake Family once owned more land in Ireland -- than the entire size of Ganaraska Forest today. 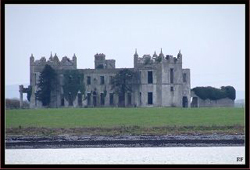 almost 12,000 acres in counties Galway..."
By the time V.B. Blake came to the Ganaraska region, extensive deforestation and poor land management practices had caused major flooding and erosion problems. By the early 1920’s, most of the original trees were gone and the land had been farmed out. Without tree cover and roots to bind the land, soils easily washed away. This resulted in vast areas being eroded and unfit for cultivation or any other purpose. The land had became barren, unproductive and windswept terrain. At Ardfree, Blake saw something had to be done and soon began his ongoing tree planting experiments. Through a small series of events in an area once described as the “sandy desert of the north”, Blake set in motion an important precedent. His ongoing project was a practical demonstration of the merits of conservation which included several tree plantations. His experiment prevented erosion, held the soil in place and reduced evaporation. In essence, the treeplanting work done under Blake’s watchful eye was a “conservation in miniature” project waiting for the big one to come. The establishment of Ganaraska Forest followed about two decades later. 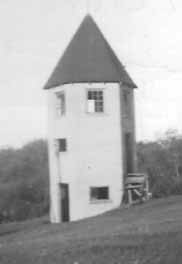 Around 1929, Blake built a prominent lookout tower on a nearby hill that was seen for miles around. This was no ordinary lookout. To the surrounding farming community, the three storey solid concrete tower with wide concrete walls was a marvel at the time which included knob and tube wiring, water (ram system), etc. - unlike anything seen locally. Blake’s inspiration for his Lookout may have come from the ancient castle lookouts in the homeland of his Irish ancestors. The tower where Blake used to write or watch the foxes now stands sentinel overlooking the mature tree plantations and quiet waters of the large scenic pond. If one looks closely, signs still remain of the well worn path from Blake's house to the tower on the hill. .
Today, Blake’s Tower is within bird’s eye-view of Richardson’s Lookout (named for his colleague, Dr. A. H. Richardson on a nearby hilltop to the south). Richardson’s Lookout was acquired in 1962 by the Ganaraska Region Conservation Authority. Symbolic in their hilltop locations and nearby proximity of each other, Richardson’s Lookout and Blake’s Lookout Tower are reminders of two great thinkers who even today cannot be far apart. Blake and Richardson passed away in the same year (1971) but their work in conservation and heritage preservation lives on for future generations. A large spring fed pond was enclosed entirely on the old Blake property. Located on the Oak Ridges Moraine, Ardfree was made up of geological formations created by the deposits left during the last Ice Age and strategically located in an important headwaters area of the Ganaraska River. An interesting mix of creeks and underground springs are also seen in this vicinity which feeds into areas downstream - including the large pond of the Garden Hill Conservation area south of the moraine. Ardfree supports the biological and physical function of the Ganaraska Forest which lies to the west and to the east. Such natural linkages, corridors and connections are important to the long term integrity and biodiversity of the Oak Ridges Moraine and Ganaraska Forest ecosystem. Historically, the pond on Ardfree was named the "Old Wilson's Pond", named after an original landowner. The spring fed waters from Old Wilson's Pond drain into the pond of the Garden Hill Conservation Area below it. On the Oak Ridges Moraine, the Old Wilson 's Pond is entirely spring fed (there is no river intake). 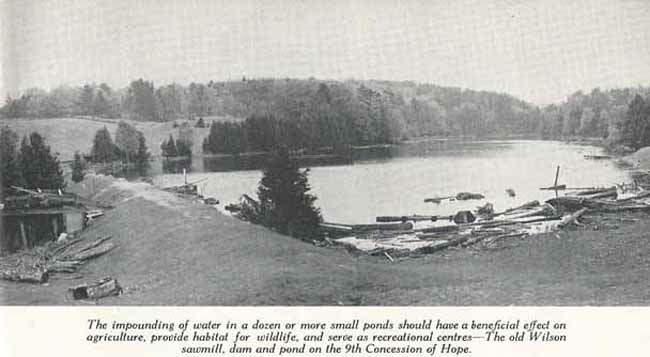 It is the only pond pictured in the Ganaraska Watershed Report (1944) by A.H. Richardson. Today, the Old Wilson's Pond is almost entirely enclosed by mature trees and beautifully reminisce of a Northern Ontario lake - unlike the early photo shown below when much of the land had been logged out. The pond at Ardfree is one of the largest visual headwater areas in the Ganaraska Forest area. Such aquifers have existed for thousands of years and have great ecological value. The groundwater is filtered through sands/gravel in the pond area and released through two dams eventually ending at its final destination in Lake Ontario. Spring fed water also flows from Ardfree's pond a few miles south-east into the Garden Hill pond below it. Acquired in 1956, the Garden Hill Conservation Area was the first conservation area acquired by Ganaraska Region Conservation Authority. Many species of birds and other wildlife are attracted to both ponds. One of the steepest and most picturesque drumlins (ridge of glacial drift) in the Ganaraska area is also seen on Ardfree. In the old days, it was a popular picnic spot. Near old Wilson 's pond, along the ridge of the surface water divide, are many underground springs feeding into little tributaries. These tiny headwater streams bubble out of the ground in seeps, swales (low hollow place between ridges) and springs and all these trickles of water, like fingers, join forces in delivering cold clean water to the Ganaraska River. During the 1800's, many dams were built on the Ganaraska River to impound areas of water. Most of these dams were for local mill operations. The dams were beneficial as they had an ameliorating effect on small floods and slowed the erosive effect of the river. They also improved summer flow in the river. Ardfee's pond has two dams. One dam originally powered a saw mill which supplied lumber from the mid 1800’s. When the property was acquired by the Blake family in 1926, the deed of sale included: “a saw mill building… and all machinery tools and plant used in conjunction therewith.” Some remnants of the early saw mill are still seen today. Blake replaced the original derelict wooden dams with two concrete dams about 1927 and 1950. If one looks closely when the conditions are right, one can still see V.B.’s initials carved into the earlier smaller dam. Henry David Thoreau as one of the greatest writers of the American conservation movement. He brought the concept of conservation into the public consciousness with the publication of his book “Walden” - a chronicle of his experiment with nature next to Walden Pond in the area known as Walden Woods. Here he contemplated the natural world and set in motion the theories of conservation in what is regarded around the world as the mostly widely read nature’s journal to this day. Millions of people around the world have been inspired by his work. Walden Pond has since been designated a National Historic Landmark and is considered the birthplace of the conservation movement – followed by other Waldens in other communities being identified and protected. During their lifetimes, V.B. Blake and H.D. Thoreau were seen by their contemporaries as rather complex, shy and reserved men. They were high-thinking naturalists and advocates of conserving natural resources on private land and preserving wilderness on public land. Neither man married. Their far-reaching ideas started to manifest into reality around the same age (at 27 years old). Having come from the city, neither man rejected civilization nor fully embraced wilderness. Instead they preferred a middle ground which integrated both nature and culture. Thoreau and Blake were little recognized, or their work understood, during their lifetimes. Both men’s greatest contributions came from their experiences in the country. Thoreau’s writings proved to have more of an impact on the men of the 20th century than the men of his own century. Blake's treeplanting experiments were seen as odd and strange by the surrounding rather tight-knit farming community - Blake’s “conservation in miniature” project now surrounded by the largest forest in Southern Ontario (Ganaraska Forest). White Pine and Oak trees prevail in both places. In his time, Thoreau would often hear 15 or more Whip-poor-will’s at a time at Walden Woods. Yet few people have seen this shy and illusive nocturnal bird. In New England (where Walden Woods is situated), legend says the Whip-poor-will can sense a soul departing and can capture it as it flees. Many years later, despite their declining numbers, the distinct calling of Whip-poor-wills are still heard at Blake's Ardfree. Ardfree and Walden are two places which show similarities - through their respective ponds, woods and association with two great men. Walden in U.S. is recognized and protected as a national historic site - Ardfree has been forgotten. In 1936, a little boy named Larry Hall (1932-2014) came to Ardfree with his Mother where he lived until around 1950. From 1936 to 1971, Edith Marion Hall was the housekeeper for Blake and was married to Blake's foreman, Hamilton K. Bell (“Hammy”). She remained at Ardfree for the rest of her life (passing shortly after Blake in 1971). With a keen eye for unusual cars from a young age, Hall still remembers the arrival of many "fancy cars" of the visitors who came to see Blake at Ardfree - cars not often seen locally. He did not know the visitors' identities but to a young boy, they were important people by the cars they were driving. These were the years of the Ganaraska study which resulted in the establishment of Ganaraska Forest. He later married Evelyn who lived in the farmhouse next door. V.B. Blake and his library was undoubtedly an influence on the young Hall. A broadcaster and journalist, Larry Hall was a Councillor of the Municipality of Port Hope (3 terms) and former Chairman of the Ganaraska Region Conservation Authority. He was served as a volunteer member with various other public bodies (history and the environment). The researcher never personally knew Verschoyle Benson Blake. 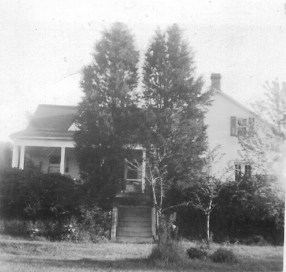 However, she knew of him and his published historical work - long before she unknowingly came to the same farm he had owned for much of his life in Hope Township, Northumberland County named “Ardfree”. In January, 2002 on a cold winter day, the empty century old wood frame house of Ardfree and the trees Blake planted silently spoke. Only in the Spring was there a meeting with the owner, Pat Daniel (nephew of V.B. Blake), when he was asked: “Who was the great conservationist who planted all the trees?” His reply was “his uncle - Vers Blake”. It was the strangest of co-incidences - or was it? Most people would never have thought to ask such a question in the first place.